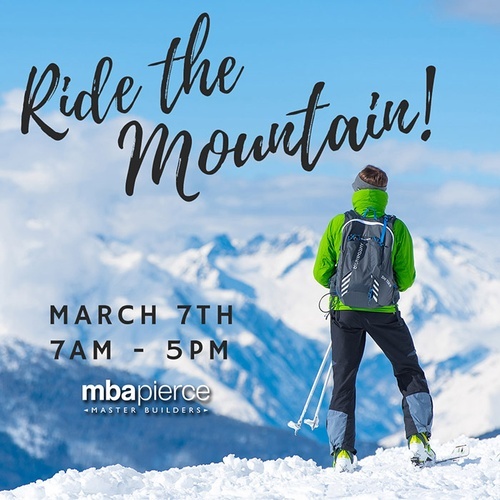 RIDE THE MOUNTAIN with MBA Pierce! - Mar 7, 2019 - Master Builders Association of Pierce County, WA ? RIDE THE MOUNTAIN with MBA Pierce! Name: RIDE THE MOUNTAIN with MBA Pierce! 5:00 p.m. -- Departure home from Crystal Mountain with snacks, music, movie and party sponsored by Sager Family Homes! **Discounted group lift tickets are available for this event which includes skiing, snowboarding, cross country, gondola rides, sledders, lessons and snow shoeing. You can also rent equipment at a discounted group rate. For questions please contact Bonnie Buffington (253-303-1680) or Carol Pope (253-380-2734). Click here for more information about our destination, Crystal Mountain.